I began to think about Marcus Mariota. His contributions to the Oregon football program go far beyond the field and his school records, because that’s what legends do, they elevate the institution or program they play for. Mariota holds every major Duck passing record, he was the first player to win the Heisman Trophy in school history, and took the program to unmatched heights in terms of wins. Now Oregon doesn’t retire numbers, but if they wanted to start with No. 8, I don’t think many fans would be mad about it. Chantel Jennings, of ESPN, recently wrote an article about the famous numbers of each school in the Pac-12. Considering there aren’t any retired numbers in Oregon history, there isn’t much talk about the green and yellow in the piece. That got me thinking, what numbers would/could/should be retired by the Ducks? The obvious place to begin the list is Mariota. Now he is focusing on becoming quarterback for the Tennessee Titans, but while he was at Oregon he was the definition of greatness. Mariota’s career record as starting quarterback is 36-5, best in program history. He scored 135 touchdowns in his career, and last season he tallied 58 touchdowns and totaled 5,224 yards; all three of which are records for the Pac-12. Including the 2014 Heisman Trophy, Mariota has 40 awards and honors in his name. He is undoubtedly the greatest Duck quarterback in history, and an incredibly strong case could be made to name him the greatest player to wear an Oregon uniform. Redshirt junior Reggie Daniels currently wears No. 8, and has since 2012. However, no offensive player has been issued the number since Mariota’s departure; and it’s possible that Oregon will no longer issue the jersey once Daniels is gone. In fact, that practice isn’t all that uncommon. For example, Stanford has retired three numbers, but not Andrew Luck‘s No. 12. Still, no player has worn No. 12 for the cardinal since he left the program. Even though the Ducks haven’t retired anyone’s number yet, the Heisman winner could be the first to earn the honor, ensuring that his legend lives on for eternity. Next on the list of great Ducks is a player known by some greybeards, but sadly, also one not many young fans are aware of. Mel Renfro played for Oregon from 1961-63, where he led the team in rushing each of the three seasons in which he played while also playing cornerback on defense. He finished his career with more than 2,000 total yards and 28 touchdowns. In 1962, he helped lead the Oregon track team to its first ever NCAA outdoor team championship and helped set the world record in the 440-yard relay in the process. The two-sport athlete went on to be a 10x Pro Bowl selection (1964, 1965, 1966, 1967, 1968, 1969, 1970, 1971, 1972, 1973) and Super Bowl champion for the Dallas Cowboys, before being enshrined in the NFL Hall of Fame and Dallas Cowboys Ring of Honor. He is also in the Oregon Sports Hall of Fame and the University of Oregon Athletics Hall of Fame. He wore No. 20. Another Duck great happened to wear No. 20 as well. That, of course, is Kenny Wheaton. Wheaton played for the green and yellow from 1994-96, and became a star his freshman season when he famously intercepted a pass from Washington Huskies quarterback, Damon Huard, as the No. 9-ranked Huskies were on the Oregon 9-yard line trailing late in the game; Wheaton returned the interception for a touchdown to seal the upset, 31-20. The Ducks would go on to win the remaining six games on the way to a berth in the 1994 Rose Bowl. “The Pick” is easily the most famous play in Oregon history. But aside from making the play that turned around the Oregon program, Wheaton was also a 3x all-Pac-10 who led the Ducks in interceptions every year he played. Currently, running back Tony Brooks-James wears No. 20, but personally I wouldn’t mind seeing the number retired for its historical influence. With the on-field dominance of Renfro, combined with the program-changing significance of Wheaton and “The Pick,” No. 20 is easily one of the most impactful numbers in the program history. Up next is a slightly different approach. Some schools issue specific numbers to specific positions — No. 55 for USC goes to outside linebacker, No. 1 for Michigan goes to wide receiver, etc. — and there are possibilities for Oregon to do this as well. For example, recently there have been two great Oregon running backs to wear No. 21. First LaMichael James from 2008-11, and by Royce Freeman from last season to present. 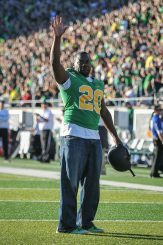 James ended his career as the greatest Duck running back. During the 2010 season, when Oregon appeared in the national title game for the first time, James led the NCAA in rushing yards with 1,682 while scoring an Oregon record 22 rushing touchdowns on his way to becoming a Heisman Finalist and Doak Walker award winner. The next season he became Oregon’s career rushing yards leader and helped the Ducks to their first Rose Bowl victory since 1917. James was the first consensus all-American in school history, and is someone all Oregon running backs should model their game after. When Freeman burst onto the scene last season, the comparisons to James were obvious. They both were physical and decisive runners for their respective sizes, both had enough speed to out-run defenders on the edge, both had tremendous freshman seasons, and of course, both wore No. 21. 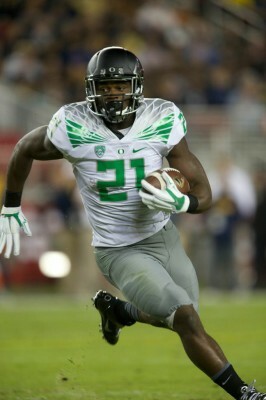 Freeman, in my opinion, has the talent to win a Heisman Trophy for Oregon before his career is over. His 18 touchdowns last year were a freshman record, and he quickly established himself as the most physical runner in the Duck rotation. Even though he will likely split time with Thomas Tyner and others again this season, there is little doubt that Freeman has the potential to be one of the best running backs in Oregon history. When Freeman ends his career, No. 21 will likely be synonymous with greatness at the running back position. This isn’t to say the Ducks should issue the number only to ball carriers, but it would be a nice unwritten rule and a way to honor the greatness of the past. Oregon does things their own way. Where others are traditional, they are revolutionary. However, now that the program has experienced sustained success and established a tradition of winning, they might look to establishing other traditions as well. Of course they can’t, and shouldn’t, retire everyone’s number, but there are opportunities to establish some new and unwritten traditions within the program. Some great players such as Joey Harrington, Bobby Moore (now known as Ahamad Rashad), Dan Fouts, Patrick Chung, Haloti Ngata and others were left off this list, but the significance of No. 8, No. 20 and No. 21 for the Ducks is undeniable. What do you think? 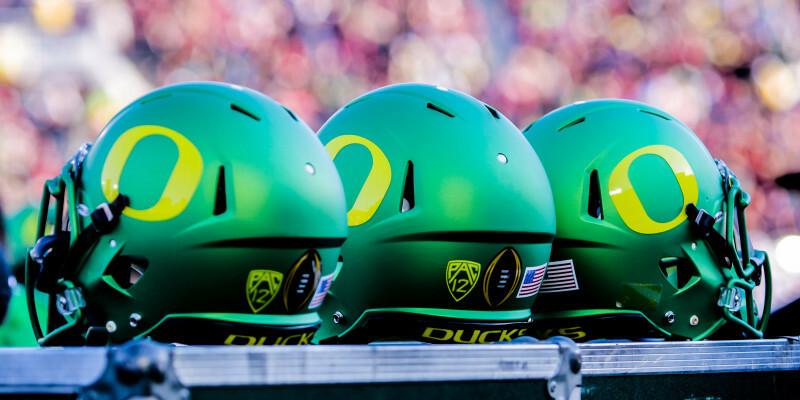 Should Oregon begin to retire numbers? If so, who should get the honor? Or should they assign certain numbers to specific positions to honor the rich history of the program? Either way, remembering the greatness of the past is just as important as planning for future success.